php-helpers: static helper functions, some utility classes and POSSE stuff including the truncenator. Slowly having the useful parts extracted into smaller packages. Most of the Taproot design artifacts are up on github too in taproot/design. All content-creation UIs in taproot are publicly viewable — take a peek! In addition to the indiewebcamp principles, these are some principles I have discovered through building taproot. Build reusable, framework-agnostic components and release them to the public, not monolithic products. Taproot was named on 2014-03-24 . All content is marked up using microformats2 so parse at your leisure. And as such I am rewriting taproot to be smaller and flatter and saner. Documentation of the aforementioned frameworkey nonsense is retained for posterity at the bottom of the page. Mentions are stored separately from the content they refer to, for ease of editing and moderation. They’re stored with a flattened h-entry-like representation of them which can be easily used in various contexts. The HTML and HTTP headers from cachable (i.e. 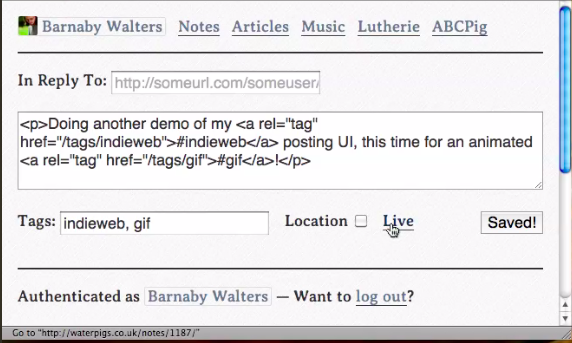 public) URLs which are fetched (e.g. webmentioned or webmentioners) are stored in an archive, which also acts as a cache. Modules all store their data in flat files (usually YAML) which I index in CSV file indexes, read/written using PHP’s fgetcsv and fputcsv functions, which are surprisingly speedy. For content which has an intrinsic name (like pieces of music, contacts or blog posts) I tend to use an ASCII-fied slug of the name for the ID, generated using Helpers::toAscii. Otherwise (for notes) I create a <= six-character ID from the newbase60 representation of epoch days + number of seconds into that day. The data is all stored in a microformats-2 JSON variant structure which is substantially flatter than mf2 JSON — all properties are properties of the parent object, not a properties key, there is no “children” key and only plural properties map to arrays. I keep most of the semantics the same except on the occasions where I prefer a different term (tag over category) or want to aggregate the properties from what would be multiple different mf properties into one (e.g. combining geo, adr and venue into “location”). Taproot has a highly modular structure. It is made up of an Application class, which handles event dispatching, simple dependency injection, routing and module loading. There are two types of modules — full modules, which expose URLs, and listeners, which listen to events dispatched within taproot. Currently there are modules for Index, Notes, Articles, Contacts, Tunes, Tags and Mentions. There are a large number of listeners which handle everything from authentication to POSSE and content transformation. Typically if I want to add a new piece of functionality I’ll do it in a listener, if I want to add a new content type I’ll create a new module. The Notes module is the mainstay of my Taproot usage. It handles the creation and display of short notes — kinda like tweets, but with a potentially much larger scope through the excessive use of tagging. As in most of Taproot, the notes module handles basic CRUDL of data, and various listeners do everything else, including converting markdown, interpreting hashtags, autolinking @names, syndication of content.